CARACAS (Reuters) - Two people who work at Venezuela's central bank were arrested on Friday after meeting opposition leader Juan Guaido, who has called on public officials to disavow President Nicolas Maduro, according to the employees' lawyer and a source familiar with the matter. The attorney, Alonso Medina Roa, said the pair - Deny Albujar and Manuel Alberto Guisseppe - had also recently taken part in protests demanding better working conditions. 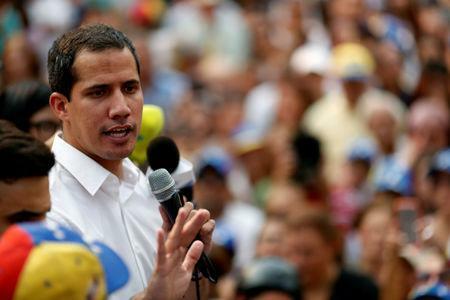 Maduro is cracking down on the opposition in a nearly three-month power struggle with Guaido, the leader of the opposition-controlled National Assembly who invoked the country's constitution to assume an interim presidency in January. He has been recognised as the OPEC nation's rightful leader by more than 50 countries, which agree with his claim that Maduro's May 2018 re-election was illegitimate. Maduro, a socialist, argues Guaido is a puppet of the United States attempting to oust him in a coup. "What is the dictatorship trying to do by kidnapping public workers who are meeting with us to recover our country?" Guaido wrote on Twitter on Friday about the arrests. "They will not be able to halt this unstoppable process to free Venezuela." Neither the central bank nor Venezuela's information ministry, which handles media for the government, responded to requests for comment.